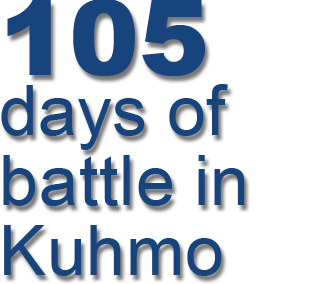 The Winter War tour gives guide app you a tour of the most important Winter War battlefields on the Kuhmo front and other relevant sites on the Kuhmo Winter War tour. The guide app utilises the user’s location data. It requires a GPS- capable terminal device and activation of the current location function. When you approach an intersection area of main roads, a battle site or another Winter War tour site, a sound will signal the approach and activate the sound file on the site. 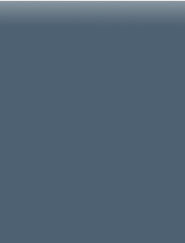 If your terminal device does not give an audio presentation on the site, you can manually access the written information by selecting the green information icon. However, this will not include intersection signals. 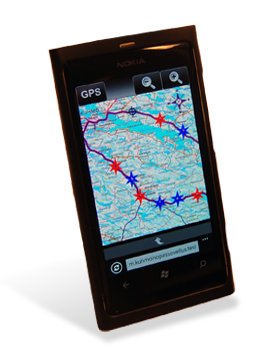 If your terminal device is not GPS-capable, the app can still function as a manually-controlled digital map and database. In this case, you must take care of the location data with the help of the guide app’s map and road signs. Due to closeness of the border zone and other data-network blind spots, it is advisable to download the guide app on your terminal device beforehand using a reliable connection to ensure that it will also be available while offline, without an internet connection, under certain conditions. The file size of the app is 17 Mb. An uninterrupted data connection is required during the download. The tour sites are represented on the app maps by symbols. The general map shows you where you can join the tour, allowing you to choose your route if there is not enough time for the complete 120-kilometre tour and connected sites. Open the guide app here. © 2013 Kuhmon Kaupunki. All rights reserved. On the southern side of Hukkajärventie Road you can see a light-coloured building that was called the Kipinä School during the war. During the war, the school functioned as the main dressing place for the wounded, under the code PSP2. The building is not a visiting site of the Winter War tour, since it is in residential use. On the northern side of the road, you can see an open courtyard with the main building of the Tyrävaara farm. At the junction of the farm drive, you can see the memorial stone for the battles that took place in the area and the ‘Winter War in Kuhmo’ information board. Tyrävaara was the place nearest to the parish village where the offensive of the reinforced 4th Company of the 118th Infantry Regiment was halted in the Hukkajärventie Road direction on 16 December. There were several skirmishes between the defending Unit Kekkonen and the attackers near the house, until on the morning of Christmas Eve, around 1.5 km east in terrain near the Ranta house, the enemy’s defence was broken and it was forced to retreat towards the east. The narrow Vääräjoki River that flows under the road shows no signs of the war. However, it was here that the swiftly advancing offensive was stopped on 5 December, albeit only for a few days. Bolstered by numerical superiority, the enemy renewed its offensive on 12 December and forced the Finnish defenders to retreat further west to Tyrävaara. Though few in number, the Finnish troops tried to stop the advancing enemy in Polvela, with no success. When the Finns gained control of the road area in their counteroffensive over Christmas, maintenance of the Finnish 9th Division was able to operate trouble-free in the Polvela area until the end of the war. There are no particular sights in the area. There were several skirmishes with enemy ski troops near Vetkontie Road. After the Finnish offensive launched in the morning of Christmas Eve succeeded in driving off the enemy troops near Hukkajärventie Road to the Kiekinkoski area, the Finnish maintenance and troop transport could operate through Korkea to the east and via Vetkontie Road to the south in the direction of Saunajärventie Road. The most significant disturbance to the operations occurred during the battle against the main force of Colonel Dolin’s ski brigade. The approximately 1,800-strong ski brigade that attacked through the woods from the direction of Hukkajärvi village sought to set free the troops encircled by the Finns along Saunajärventie Road. They failed, however, because over 1,500 soldiers of the brigade fell in decisive woodland battles near the Kesseli and Vetko houses on 12–16 December. The rest fled into the woods, scattered and further pursued by the Finnish patrols. The survivors ran for the border, trying to make contact with their own troops. The encirclement that formed in Reuhkavaara, east of the intersection of Saunajärventie Road and Vetkontie Road, was fired at with heavy weaponry starting 20 February. The capture of the well-equipped encirclement was completed on 25 February 1940. No particular sights. There were attempts to capture the encirclement that formed in a favourable position on the Loso house clearing starting 27 February. The final attempt was made on 3 March. However, the encirclement received plenty of aerial support and its core remained unconquered until the end of the war. No particular sights. The last and bitterest front battles of the war took place in the Löytövaara area. However, the Finns managed to repel the fierce attacks of the numerically superior enemy until peace was declared. An enemy stronghold was located on the western edge of the Löytövaara area in Paloaho. The Finns were able to seize it on 11–12 February. Some of the stronghold’s structures have been reconstructed in their original locations on the north side of the road close to the parking area where there is also a burial place, memorial and info board. There is also a small memorial stone close to the Löytövaara house on the northern road bank erected by brothers in arms from Mänttä. In Kilpelänkangas, the Finns faced the fiercest heavy weapon fire of the war. It completely wiped out the area’s trees, among other things, in February 1940. After heavy losses on both sides, the defenders were forced to retreat further west to Löytövaara on 3 March 1940 after the Kuusilinja Line broke. Next to the memorial is a Winter War in Kuhmo information board that describes the last battles of the war in Kilpelänkangas and Löytövaara. There is also a hiking path that starts at the memorial and overlooks some structures from the stream-floating era. On the slope on the northern side of Saunajärventie Road, at the western end of Laamasenpolku Path, there is a sign for a path that leads to the former courtyard of the Ala-Laamanen house, where the Finnish troops first made contact with the enemy in the morning of 30 November 1939. The clash claimed the life of a reserve private soldier and the family’s 13-year-old boy, Eino. The reservist was the first Finnish soldier and Eino was the only civilian to die in the Kuhmo battles. The path is approximately 3 km long, with the Ala-Laamanen courtyard located around halfway. There is a memorial stone and an information board. The other end of the path is along this same road, approximately 2.2 km to the east. A large encirclement formed near the Kannas and Niska houses in Saunajärvi when the Finns captured the road section east of the Kannas house on 6 February. There were more instances of fighting in the area, but it remained under enemy control until the end of the war. There is a memorial for the Soviet soldiers who died in Kuhmo during the Winter War by the road, next to the Niskankoski parking area. This is a good place to start exploring the surrounding area. Higher up, near the former school and by the reconstructed field fortifications, there is an information board on the area. On the northern side of the road, down by the rapids, there is also a renovated watermill. Known as “Luelahti” during the war, this area on the shore of Lake Saunajärvi was where the enemy division’s staff and maintenance departments were encircled. The battles claimed many lives on both sides and first split the encirclement into three parts. After the eastern part and the “Staff hill” in the middle were captured, the struggle to claim the final third of the encirclement was ended by the declaration of peace on 13 March 1940 at 11 am. In the middle of the bend, Kähköläntie Road starts towards the south-east. Next to the intersection on the southern side is an information board describing the above-mentioned battles. Further back there is a memorial for the Soviet soldiers who fell in the encirclement battles. An encirclement that formed in the area near the Klemetti household was split in two on 4–5 February when the Finns succeeded in capturing a section of the road a little less than a kilometre east of the Klemetti house. However, both sections remained under enemy control until the end of the war despite several attempts by the Finns to capture them. On the southern side of the road, opposite the forest road intersection, stands a memorial for the soldiers from Taivalkoski who fell on the Kuhmo front. It lies west of the “Stronghold 101” area, which became a separate encirclement in the Klemetti battles, approximately 1½ km east of the Klemetti household. The leading edge of the quickly advancing enemy’s 337th Infantry Regiment took possession of the intersection areas of Nurmestie Road and Lieksantie Road on 6 December 1939. It was not until the counteroffensive that was launched on 29 January 1940 that the Finns managed to besiege the enemy troops in several encirclements along their approach road. The largest and best-equipped encirclement on the Kuhmo front stretched from the Sivakka area over the Nurmestie Road intersection towards Kuhmo Centre after the Finns managed to encircle the vanguard of both the 337th Infantry Regiment advancing through the terrain and the 118th Infantry Regiment attacking along the road. This large encirclement in Rasti retained its position until the end of the war. There are no particular sights in the area. Several battles were fought over the control of strategically important positions in the hills on the eastern side of Nurmestie Road. The enemy managed to bring artillery to Kankivaara, which enabled it to hinder the activities of the Finnish troops, occasionally very effectively. Finnish troops that delayed the enemy offensive in the direction of Saunajärventie Road retreated to positions that had been constructed in the Jyrkänkoski area after 11 December. The enemy’s main offensive in the Kuhmo area towards their target, Oulu, was stopped here. There is an information board on the Winter War and the local battles near the partially reconstructed Finnish stronghold. In the summer there are local exhibitions on wartime heavy artillery and other Winter War materials organised by the reservist organisation. The Kiekinkoski area saw several outbreaks of fighting. At the beginning of the war, the reinforced 4th Company of the 54th Soviet Division’s 188th Infantry Regiment attacked across the border to Lake Hukkajärvi, forcing the few defenders to retreat to Kiekinkoski on 2 December 1939. The enemy swiftly advanced towards Kuhmo Centre all the way to Tyrävaara but was beaten back to its approach road in the Christmas Eve counteroffensive and obliterated in a decisive battle in Kiekinniemi on 28 December 1939. There were no more major battles in the area after that, although some Red Army ski troops moving in the region were called in as reinforcements. The dugouts near the road in Kiekinniemi are part of the Salpalinja Line, which was built during the Interim Peace, partially on top of a few structures from the Winter War. Attacking from the direction of Repola, the vanguard of the enemy’s 4th company of the 118th Infantry Regiment did not cross the border until 1 December, when it made battle contact with a small troop of Finnish border men at the eastern end of Lake Hukkajärvi. The Finns were forced to beat a hasty retreat, but there were also clashes near Lake Hukkajärvi later on, such as further west on the Hukkajoki Line. The main force of the enemy’s ski troops also attacked from the direction of Lake Hukkajärvi towards Saunajärventie Road in early February.